Close by Faversham Parish Church stands the Old Grammar School, built in 1587-88. A plaque of some age wrongly proclaims, reflecting confusion in local histories, that it was built in 1567. 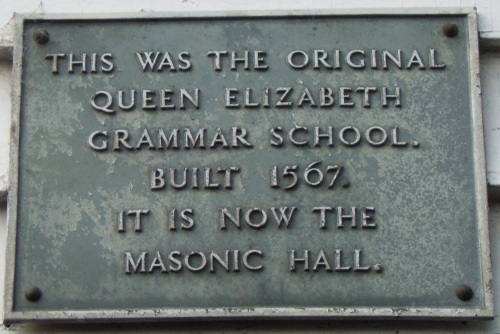 The grammar school was established in 1576 by Queen Elizabeth I as a replacement, in her name, for the school at Faversham Abbey lost to the town when Henry VIII abolished the monasteries. Situated in a leafy backwater known variously as Church Walk or Shooting Meadows Walk, the old schoolhouse is now a masonic hall and looks out on 1960s buildings of today's Queen Elizabeth's Grammar School.